"...abstract objectives and to focus their efforts on two measurable outcomes that have always mattered since the growth of large cities during the 19th century’s industrial revolution: workers’ spatial mobility and housing affordability". This year's edition has been expanded to nine geographies, including Australia, Canada, Hong Kong, Ireland, Japan, New Zealand, Singapore, the United Kingdom, and the United States. A total of 85 major metropolitan areas (of over 1,000,000 population) are covered, including five of the six largest metropolitan areas in the high income world (Tokyo-Yokohama, New York, Osaka-Kobe-Kyoto, London, and Los Angeles). Overall, 360 metropolitan markets are included. 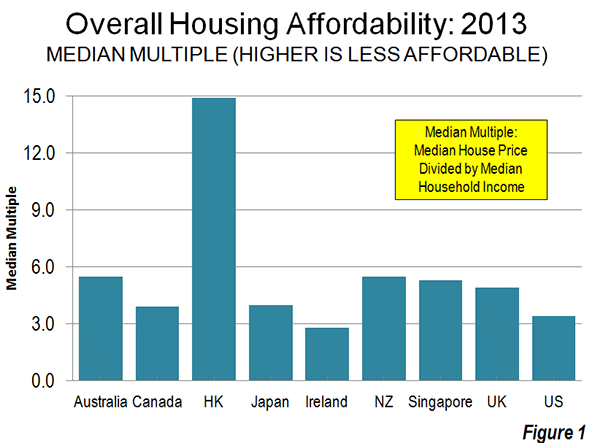 The Demographia International Housing Affordability Survey uses a price-to-income ratio called the "median multiple," calculated by dividing the median house price by the median household income. Following World War II, virtually all metropolitan areas in Australia, Canada, Ireland, New Zealand, the United Kingdom, and the United States had median multiples of 3.0 or below. However, as urban containment policies have been implemented in some metropolitan areas, house prices have escalated well above the increase in household incomes. This is exactly the effect that economics predicts to occur where the supply of a good or service is rationed, all things being equal. Notably, Japan's two largest metropolitan areas, Tokyo-Yokohama and Osaka-Kobe-Kyoto have avoided the severely unaffordable territory occupied by the other three megacities (New York, Los Angeles, and London). 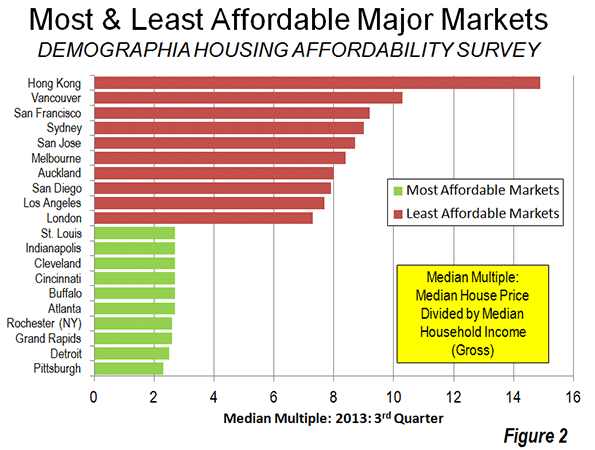 Osaka-Kobe-Kyoto has the best housing affordability of any megacity, at 3.5 (moderately unaffordable) and Tokyo-Yokohama is at 4.4 (seriously unaffordable). 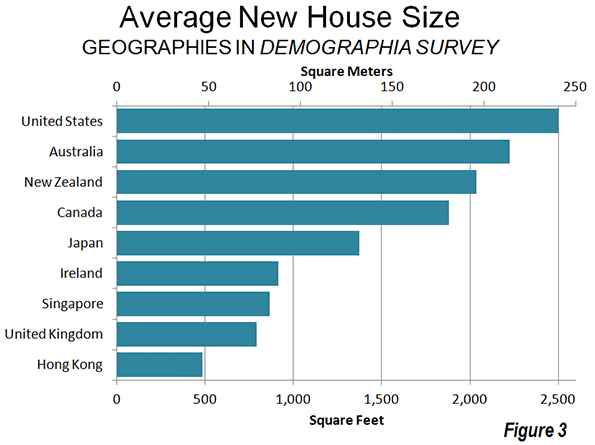 This year's Demographia Survey also provides information on average new house size in the nine geographies (Figure 3). 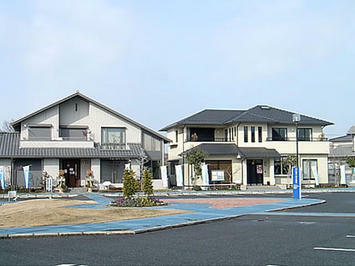 The largest houses are in the United States, which is second only to Ireland in affordability. The smallest houses are in Hong Kong, which also has the least affordable housing. In living space those who pay the most get the least, while those who pay the least get the most. "But if planners abandoned abstracts and unmeasurable objectives like smart growth, liveability and sustainability to focus on what really matters – mobility and affordability – we could see a rapidly improving situation in many cities. I am not implying that planners should not be concerned with urban environmental issues. To the contrary, those issues are extremely important, but they should be considered a constraint to be solved not an end in itself." The annual household income for Hong Kong is not as high! Submitted by MarioDonoso on Thu, 01/23/2014 - 10:38. Submitted by davebarnes on Mon, 01/20/2014 - 14:10. "Rockford and Utica in the United States are ranked as the world's most affordable "
Who would ever want to live in either one of these places? Submitted by PhilBest on Fri, 01/24/2014 - 03:47. How less desirable are Rockford and Utica than Liverpool and Newcastle? Because the property values in the latter 2, in spite of major population loss over the last 3 decades, are prevented from ever falling to recovery-assisting levels by their incredibly obstructive town planning systems.